Fig. 1. Scanning electron microscope image of (a) nanogap pair electrodes embedded in nanochannel and (b) magnified view of the nanogap, in which ion current flows along the nanochannel and tunnel current passes across the nanogap between the electrodes . Fig. 2. Schematic illustrations of (a) ion current and (b) tunnel current in single molecule detection. Fig. 3. 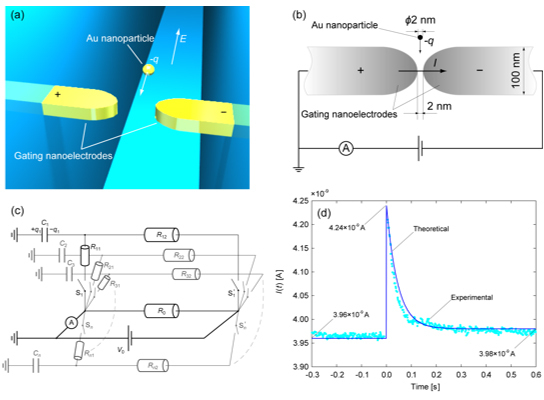 Schematic illustrations of (a) nano-gapped gating electrodes in a nanofluidic channel to detect a single nanoparticle by tunnel current, (b) dimensions of the experimental system, and (c) electric circuit model of the single particle detection and (d) comparison between theoretical  and experimental  results. Tsutsui, M., Taniguchi, M., and Kawai, T., “Transverse Field Effects on DNA-Sized Particle Dynamics”, Nano Letters, Vol. 9, No. 4 (2009), pp. 1659–1662. Tsutsui, M., Taniguchi, M., Yokota, K., and Kawai, T., “Identifying Single Nucleotides by Tunnelling Current”, Nat. Nanotechnol., Vol. 5 (2010), pp. 286–290. Ohshiro, T., Matsubara, K., Tsutsui, M., Furuhashi, M., Taniguchi, M., and Kawai, T., “Single-Molecule Electrical Random Resequencing of DNA and RNA”, Sci. Rep. 2, 501 (2012). Uehara, S., Shintaku, H., and Kawano, S., “Electrokinetic Flow Dynamics of Weakly Aggregated λDNA Confined in Nanochannels”, Trans. ASME., J. Fluids Eng., Vol. 133 (2011), pp. 121203 (8 pages). Yasui, T., Rahong, S., Motoyama, K., Yanagida, T., Wu, Q., Kaji, N., Kanai, M., Doi, K., Nagashima, K., Tokeshi, M., Taniguchi, M., Kawano, S., Kawai, T., and Baba, Y., “DNA Manipulation and Separation in Sublithographic-Scale Nanowire Array”, ACS Nano, Vol. 7, No. 4 (2013), pp. 3029–3035. Nagahiro, S., Kawano, S., and Kotera, H., “Separation of Long DNA Chains Using a Nonuniform Electric Field: A Numerical Study”, Phys. Rev. E, Vol. 75 (2007), pp. 011902 (5 pages). Doi, K., Haga, T., Shintaku, H., and Kawano, S., “Development of Coarse-Graining DNA Models for Single-Nucleotide Resolution Analysis”, Phil. Trans. R. Soc. A, Vol. 368 (2010), pp. 2615–2628. Qian, W., Doi, K., Uehara, S., Morita, K., and Kawano, S., “Theoretical Study of the Transpore Velocity Control of Single-Stranded DNA”, Int. J. Mol. Sci., Vol. 15 (2014), pp. 13817–13832.
) Doi, K., Ueda, M., and Kawano, S., “Theoretical Model of Nanoparticle Detection Mechanism in Microchannel with Gating Probe Electrodes”, J. Comput. Sci. Technol., Vol. 5, No. 2 (2011), pp. 78–88. Szarek, P., Suwannawong, S., Doi, K., and Kawano, S., “Theoretical Study on Physicochemical Aspects of a Single Molecular Junction: Application to the Bases of ssDNA”, J. Phys. Chem. C, Vol. 117 (2013), pp.10809–10817. Kawaguchi, C., Noda, T., Tsutsui, M., Taniguchi, M., Kawano, S., and Kawai, T., “Electrical Detection of Single Pollen Allergen Particles Using Electrode-Embedded Microchannels”, J. Phys. : Condens. Matter, Vol. 24 (2012), pp. 164202 (6 pages). Uehara, S., Tsutsui, M., Doi, K., Taniguchi, M., Kawano, S., and Kawai, T., “Fluid Dynamics and Electrical Detection of λDNA in Electrode-Embedded Nanochannels”, J. Boimech. Sci. Eng., Vol. 8, No. 3 (2013), pp. 244–256. Doi, K., Tsutsui, M., Ohshiro, T., Chien, C.-C., Zwolak, M., Taniguchi, M., Kawai, T., Kawano, S., and Di Ventra, M., “Nonequilibrium Ionic Response of Biased Mechanically Controllable Break Junction (MCBJ) Electrodes”, J. Phys. Chem. C, Vol. 118 (2014), pp. 3758–3765. Lagerqvist, J., Zwolak, M., and Di Ventra, M., “Fast DNA Sequencing via Transverse Electronic Transport”, Nano Lett., Vol. 6, No. 4 (2006), pp. 779–782.